Histories of the National Mall | James L. Farmer Jr.
James L. Farmer Jr., “James L. Farmer Jr.,” Histories of the National Mall, accessed April 23, 2019, http://mallhistory.org/items/show/149. 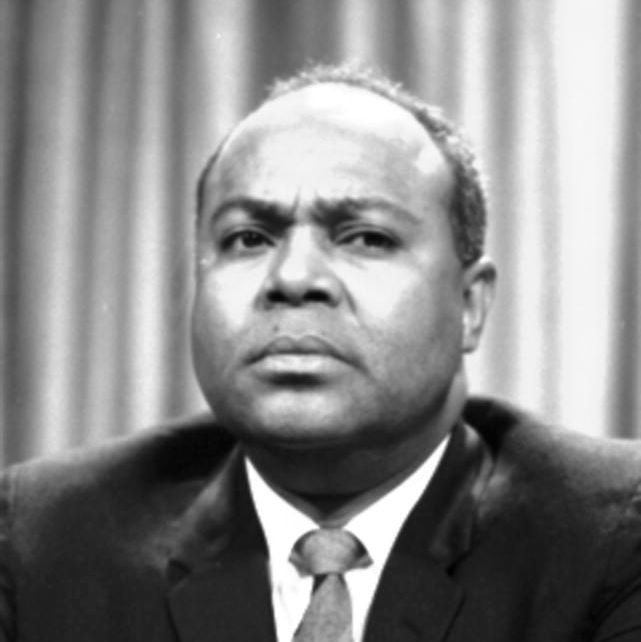 James Farmer was one of the leaders of the 1963 March on Washington for Jobs and Freedom. As one of the founders of the Congress on Racial Equality (CORE), an interracial civil rights organization, and its National Director in the early 1960s, Farmer was a major figure in organizing civil rights protests. While he participated in the planning for the March on Washington, Farmer was unable to attend the event because he had been arrested at a protest in Louisiana. But, imprisonment did not prevent him from being heard in Washington: his speech was read by fellow CORE member Floyd McKissick. In the speech, Farmer declared that the fight for racial equality would not end "until the dogs stop biting us in the South and the rats stop biting us in the North." James Leonard Farmer Jr. was born in Marshall, TX in 1920. His father, James Farmer Sr., was a Methodist minster and one of the first African American men in the state to earn a PhD. The family moved to Mississippi and back to Texas during Farmer's childhood as his father took teaching positions at various colleges. Farmer was accepted at the age of 14 to Wiley College in Marshall, TX. In 1938, he graduated and moved on to Howard University in Washington, DC, where he studied religion. His master's thesis examined the interrelatedness of economics, religion, and race. During his time at Howard, Farmer began to work with the Fellowship of Reconciliation, a pacifist Quaker organization. In 1942, Farmer cofounded the Committee of Racial Equality (CORE), an interracial civil rights organization dedicated to the idea that racial equality is necessary for a just society. Throughout the 1940s and 50s, Farmer was a prominent civil rights leader, fighting to end segregation. In early 1961, he became the National Director of CORE, now the Congress of Racial Equality. He led the first group of Freedom Riders, an interracial group of activists who rode buses in southern states to desegregate them. Farmer and his fellow activists were repeatedly threatened and attacked, as they worked to confront the racial segregation across the south. Farmer was one of the organizers of the 1963 March on Washington for Jobs and Freedom but could not attend the March because he had been arrested in Louisiana while protesting segregation. His speech was read by a fellow CORE member, Floyd McKissick, who would take over as director of the organization when Farmer resigned in 1966. Farmer's resignation was prompted by increasing conflict over whether civil rights activists should take more confrontational action in their protests. He spent the 1970s working with the Council on Minority Planning and Strategy and organizations which promoted integrated housing. In 1984, Farmer accepted a position as a professor at the College of Mary Washington in Fredericksburg, VA, where he taught until 1998, a year before his death. He published an autobiography, "Lay Bare the Heart," in 1986. In 1998, he was awarded the Presidential Medal of Freedom for his work for racial equality.